Here is a list of Navratri recipes that you can try 9 days of the festival. Navarathri (Navratri) is a Hindu festival celebrated with great zeal in Karnataka along with the rest of the country. The festival is about worshipping the different forms of Goddess Durga for nine days. The deity is offered hearty obeisance throughout the nine days of the festival. Apart from pure devotion for the Feminine, these nine days are also about food and fasting. It is believed that Goddess Durga loves sweets. As such, I bring to you a special sweet delicacy prepared as an offering for the Goddess. Besides, we have also enlisted the two recipes each of savory and dessert, especially prepared during the Navarathri. This is an awesome sweet recipe and easy to cook too. This is indeed one of the sweet Navratri recipes you should prepare. Boil the rice. Make sure it’s not overcooked. Fry the cashew nuts and raisins in ghee on medium heat. Once done, shift them into a plate. Boil ½ cup water. Empty the grated jaggery into it until it has dissolved completely. Strain the syrup to get rid of residues, and put it back on flame again. Add the cooked rice into the jaggery syrup. Add the grated coconut and stir. Cook until the excess moisture disappears. Now, drop the fried cashew nuts and raisins. Sprinkle the cardamom powder and mix well. The Gudanna is ready to be offered to the Goddess. This is one of the best savory Navratri recipes and must try one. Start with making preparations for the kanaka. Mix together the dry ingredients for kanaka (flour, salt, and turmeric powder). Pour water to make dough softer than the one for the usual chapattis. Pour in the cooking oil and smear the dough generously with the oil. Let the dough rest for half an hour. Meanwhile, start preparing the hoorana. In a mixer, grind together the grated coconut, jaggery, and cardamom powder into a fine paste. Add water, if required. Shift the hoorana into a frying pan. Keep stirring the mixture on medium flame until the water has dried. But make sure it doesn’t dry too much to turn crusty. Take small portions of the hoorana and make lemon-sized balls. Do it when the mixture is warm enough. The balls must be soft, but stiff. Repeat the balls-making process with the kanaka as well. Next, with your fingers, gently press a deflation at the centre of the dough ball. Place a hoorana ball on the deflated center of the dough. Gently, start pushing the hoorana inside, covering it completely with the edges of the dough ball. 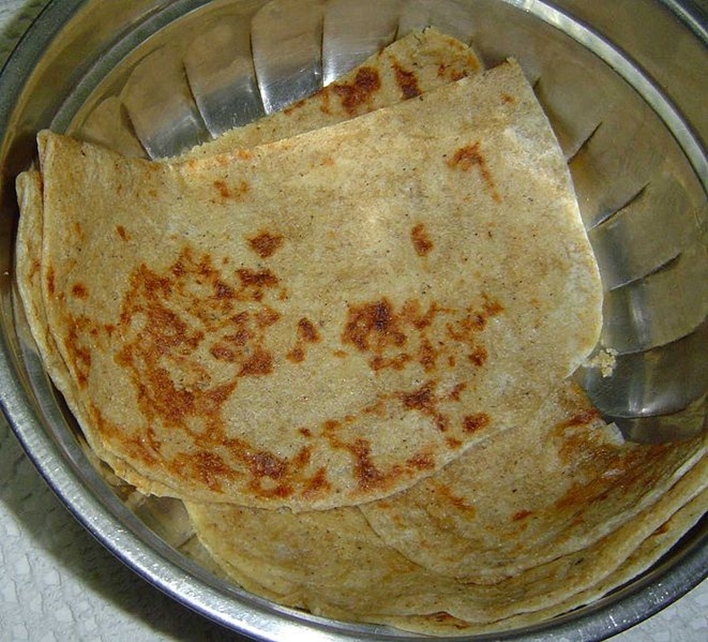 Rub generous amount of flour over the stuffed dough ball and roll it into a thin chapatti. Repeat the process with the rest. Roast them on both sides until brown patches begin to appear. Smear them with ghee before serving. This is one of the best savory Navratri recipes you can try this festive season. Boil rice. Make sure not to overcook. Soak the tamarind in a cup of warm water and keep aside. Roast the sesame seeds until they are nicely swollen and exude a sweet smell. Roast the grated coconut on a dry pan until crisp. Heat 1 teaspoon of cooking oil in a pan. Fry all the ingredients for the masala except for the sesame seeds and the grated coconut (already roasted separately). Once the fried ingredients cool down, transfer them into the mixer along with the roasted sesame seeds and coconut. Dry grind them. Keep aside. Heat a thick bottomed pan. Strain the tamarind water and pour it into the pan. Add the jaggery, salt, and turmeric powder. Boil the syrup until it’s reduced to a half. Into this thick tamarind syrup, add the ground masala and 3 tablespoon of cooking oil. Keep frying on medium flame until the masala separates from the oil. Meanwhile, in a separate pan, heat 2 tablespoon cooking oil. Drop in the tempering ingredients. Let the mustard seeds splutter. Next, pour this into the cooked rice. Add the spicy tamarind masala, and mix well. 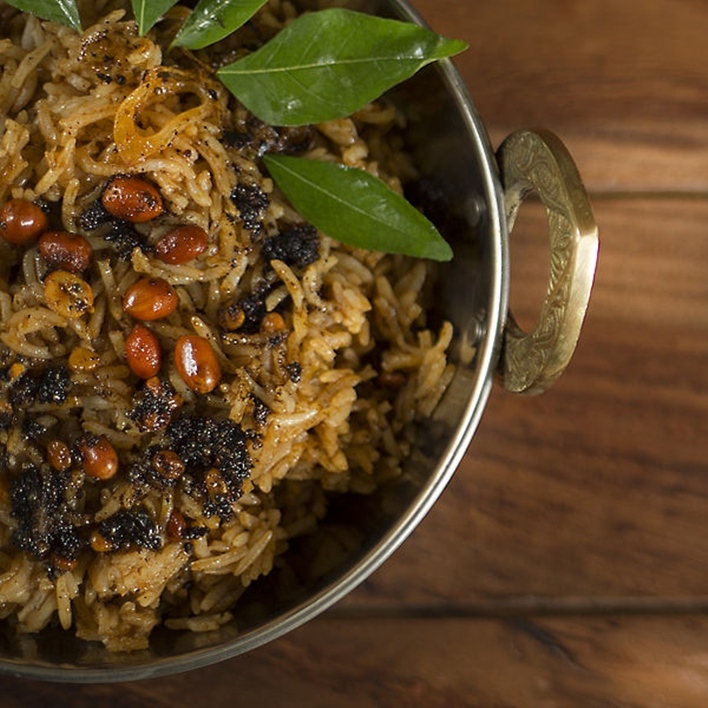 If you are a lover of spice and lentils this one of the Navratri recipes you must try. Soak the chanda dal for around 5 hours. Next, grind them into a coarse paste without adding any extra water. Transfer the paste on a plate. Add the chopped green chilies, curry leaves, cilantro, asafetida, and salt. Mix well. Add the chopped cabbages and give it another mix. The cabbages shall lend softness to the patty or vada. Take a small portion of the mixture and make lemon-sized balls. 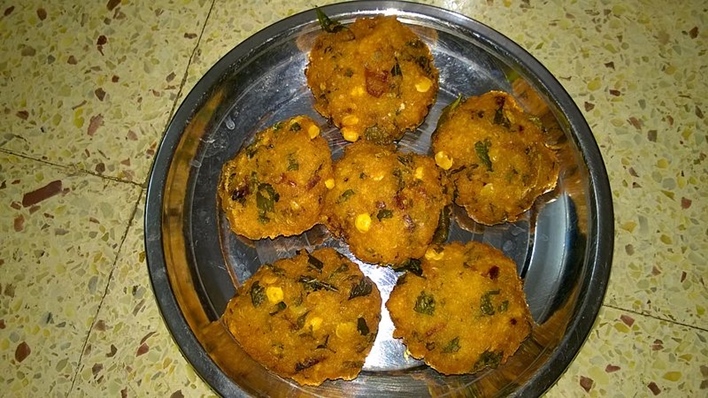 Press the vadas between the palms to give them a flat shape. Deep fry the vadas on medium flame. Serve smoking hot with spicy chutney. Enjoy this festival season with a dash pineapple. Boil the jaggery with a cup of water to get thin syrup. Strain the syrup to get rid of any residue at the bottom. Mix the rice flour with water and make a thin paste. Keep it aside. Into that same pan with ghee, add the chopped pineapples. Fry them on medium flame until they turn soft. Next, pour in the jaggery syrup into the pan. Allow it to cook on low flame for 25 minutes, or until the pineapples have turned succulent. Finally, pour in the coconut milk, followed by the rice flour paste. Keep stirring continuously. Sprinkle a pinch of salt. Keep stirring. Lastly, add the fried cashew nuts and raisins, as well as the cardamom powder. Give it a final mix. Make sure not to cook the payasa for too long once you add the coconut milk.